First, I will start off by telling you I have flat feet. Growing up my friends would joke and say I had water skis as feet. Long, skinny, and flat, perfect for catching waves but questionable for running miles. Years later who would have thought I would run many marathons and ultramarathons with those same flat feet. However, I couldn’t always run such long and taxing distances. When I first began running, It felt like I was learning more about managing pain then the act of running itself. My knees hurt to the point where I almost gave it all up. Well, that was until I realized the importance of buying a running shoe designed for my flat feet. Once I ran with a shoe made for my feet the pain dissolved and I could focus on what was most important: Running. What are flat feet exactly? So what exactly is overpronation? In layman’s terms, it’s feet without arches. That’s compared to so-called “normal” feet with arches or low arches. It’s important to understand flat feet themselves don’t negatively impact your run. The problem is flat feet cause you to overpronate. And overpronation is what wreaks havoc on your body. It causes pain in the knees, ankles, hips, and low leg muscles. Buying a shoe designed for overpronation is essential for flat footed runners. These shoes compensate for overpronation which creates a natural stride. A natural stride puts a stop to overuse injuries and pain in your running. With the right shoe, overpronation is neutralized and running becomes an enjoyable experience, not a painful one. Choosing the right running shoe for flat feet is crucial when you run. With each stride, your feet hit the ground, and if you’re running with the wrong shoe, it will create problems. This holds especially true when you overpronate from flat feet. First, pronation is the normal roll of the foot. It’s when your weight is distributed from the heel to the forefoot during your stride. Overpronation occurs when your feet roll inward too much. An inward roll causes the rest of your body to overcompensate. This creates a big problem for runners because it places excessive stress on your tendons, ligaments, and muscles. So now, the longer you run, the more likely you are to develop an injury. Running with the wrong shoe will not only create pain, but it can cause injuries that force you to stop. You often here runner’s complaining about common injuries like runner’s knee, plantar fasciitis, and achilles tendinitis. Some blame running itself but the injuries typically stem from the wrong shoes or poor form. The good news is once you switch to a shoe designed for overpronation, overuse injuries go away. That’s why choosing a shoe from this list will significantly reduce the chance of pain. Less misaligned stress on the body will allow you to run pain-free. Most running shoes fit into three categories: overpronation, neutral, and supination. As discussed, overpronation occurs when your feet roll inward too much. This inward roll will cause the rest of your body to overcompensate. That’s why it’s vital to use a running shoe that’s stable and comfortable. With a running shoe designed for overpronation with extra support, it will effectively absorb the shock created by hitting the ground. This helps minimize the effects on the body from running with flat feet. When I look for a new running for my flat feet, stability and comfort are always number one. 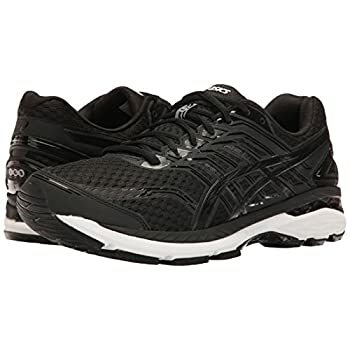 Made for overpronators, the ASIC GEL-Kayano 24 is one of the top selling running shoes in the Market today. Its design is built for comfort and stability. This helps flat feet runners remain injury free and increase their running efficiency. When you run with flat feet overpronation causes more pain the longer you run. However, through the ASICS I.G.S.® (Impact Guidance System) design your feet roll more natural. That’s versus an inward roll like most flat feet runners tends to have. So now, you may run longer mileage with fewer issues providing the platform to become a better runner. It’s users praise this shoe for its incredible comfort. The gel technology and cushioning system within the shoe are designed for shock absorption. Now, instead of feeling intense impact from flat feet, the force is absorbed. When you have developed pain from running, then switch to a shoe that stops the pain, you become a customer for life. That’s what makes this shoe a top seller. It not only provides a smooth and comfortable ride but it has brought running back into many peoples lives. Now that’s the real definition of a quality running shoe. Pros– extra comfort for long runs, great for long-distance running, breathable, excellent traction, shock-absorbing. Cons– too snug for some runners, price, heavy. If your feet hurt during and after a run, grab a pair of the Brooks Beast 16s. The best feature for flat feet runners is the supportive midsole design. This provides a smooth and natural stride similar to the experience of a neutral runner. Its an overpronators dream as it helps those runners who need extra arch support. What’s also great about the shoe is it’s built for the road, indoors, and even light trails. It indeed is a BEAST. A lot of times when you buy supportive running shoes you find them to be stiff and uncomfortable. 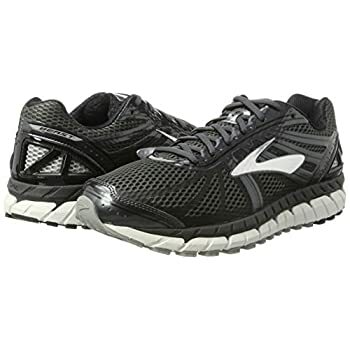 However, Brooks does an excellent job with this shoe as runners say it’s both supportive as well as flexible. Ever hear of the term “pounding the pavement”? As runners, we constantly absorb excessive shock from running on roads. Over time it can put a lot of wear and tear on the body. Fortunately, Brooks released their BEAST to help. Its users say it feels like your running on a pillow or mattress. Now if that’s not comfort I don’t know what is! If you’re looking for a cushioned and supportive ride, give the BEAST a try. Pros- an excellent cushion for running on pavement, made for different terrain, flexible for a supportive shoe, stable with motion control. Cons– heavy, sizes run small. For runners with flat feet, a stable and comfortable shoe is essential. But the more stable and comfortable the shoe, typically, the heavy it must be. When you have flat feet, you want first to find a shoe that supports your overpronation and absorbs shock. Afterward, consider weight if speed is important to you. For example, if you’re a casual runner, you may have no interest in speed, and a heavy shoe is acceptable. Whereas if you’re training for a marathon, you may be looking to cut some weight off your shoes. 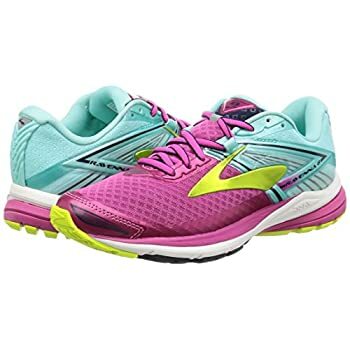 With that said, if you’re looking for a stable yet lightweight shoe, then the Brooks Adrenaline GTS 17 has you covered. Better yet, this shoe comes with a Progressive Diagonal Rollbar providing further support for overpronation. It’s users who have reported to be overpronators love this shoe. Many claim it has helped end overuse injuries like plantar fasciitis. If you’re looking to do some long and fast running on the road, this shoe is a preferred choice. Pros– superior stability, fast ride for a stability shoe, excellent comfort. Cons– sizes run small, lighter than most stability shoes but still heavy for some. 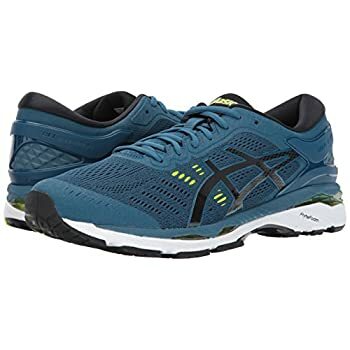 If you’re looking to clock some high mileage while remaining comfortable and stable, then the ASICS GT-2000 5 is the shoe for you. Running long miles lead to sore legs and painful feet, especially for flat foot runners. Well, the Triple Density Compression Molded Foam and Gel pad inserts do a great job to reduce pain. They even come with a unique lacing system to help. When you run long distances sometimes the top of the feet can become painful from the placement of your shoelaces. Some runners lace their shoes different ways to help. However, ASICS new lace design plus its upper fitting mesh relieves tension on the upper foot. This is just one more benefit the shoe has to offer. Users say they take time to stretch out but once worn in they become super comfy and are perfect for long mileage. If you’re a flat-footed runner looking for a durable shoe for the extra mile, this is a shoe you can depend on. Pros– comfortable soles, very flexible, excellent shock absorption, maximum stability, upper shoe much more comfortable than others, multiple color options. Cons– plain design, take time to break in. Whether you want to run on the road, track, treadmill, or a light trail, the Saucony Guide 10 will be beneficial. It’s firm and stable but still holds it’s comfort through its PowerGrid full length cushioning and SRC impact zone. They quickly become an extra layer of protection for the disproportionate impact some flat foot runners can experience. 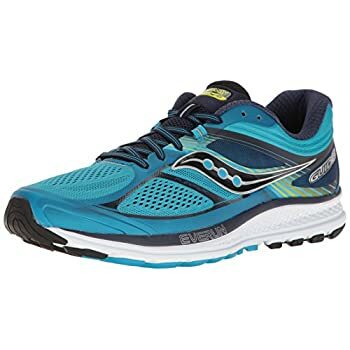 If you don’t overpronate too much and want a quick and responsive ride for a reasonable price, give this Saucony shoe a try. They may not have all the bells and whistles like other shoes but added features aren’t for everyone. If you’re a casual runner who wants extra comfort at an affordable price, then give them a try. Plus, the Saucony company has been around for over a century. They know running shoes. When choosing Saucony, you are buying a quality shoe at a quality price. Also, you often hear runners having sizing issues when switching shoe brands. Although sizing is supposed to be universal, some shoe companies fit differently than others. Often shoes will run too small or large, so your heel ends up sliding out, or your toes feel too tight. However, many users of this shoe have said they fit well from heel to toe. Now, that doesn’t mean all runners will have the same experience, but it gives you better chances of finding a well-fitted shoe. When you buy a shoe online, it’s much more convenient to get the size right the first time. Pros– price, practical for different running surfaces, sized well, very responsive, durable. Cons– price, practical for different running surfaces, sized well, very responsive, durable. Nike was the first running shoe I purchased that cured my knee pain created from overpronation. They’ve been the dominant name within the running industry for quite some time. So trust that when you purchase a Nike shoe, you’re buying quality. Also, I can tell you from experience that they have an excellent return policy. Most running companies will not accept returns after running on them. Not Nike. They have a hassle free return policy. They are returnable within 30 days even if they are used. Now that’s customer service! 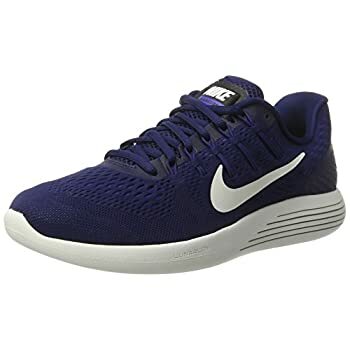 The Nike LunarGlide 9 is a lightweight and comfortable shoe supportive for any distance. Whether you’re running a few times around a track or taking them out on a long weekend run, this shoe has you covered. The combination of its stability and cushion helps to compensate for overpronation. Through the upper mesh and Lunarlon foam midsole, it provides a responsive transition from heel to toe with every stride. Like most Nike shoes it comes in many different colors. So grab a few pairs. If you are training for a marathon, it’s good practice to rotate three pairs all evenly wearing together. So with multiple color options, you can choose three different colors to prevent confusion during rotation. Its users say they fit like a glove! Nike is always a safe bet when it comes to buying running shoes. Pros– lightweight especially for a stability shoe, excellent arch support, excellent breathability, stylish design. Cons– tight feel for some, no motion control. New Balance doesn’t always make the most fashionable shoe, but the 1260v6s are one of the more attractive styles. New Balance focuses more on practicality than design if you ask me. When you think of New Balance, you can’t help but think of their durability. I’ve been running with New Balance shoes who quite some time. I’ve worn New Balances through marathon distances and 100-mile ultramarathons. 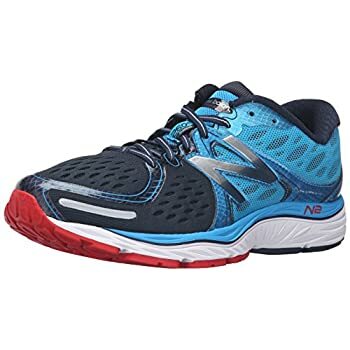 In the 1260v6 model, New Balance focuses on the stability ABZORB crash pad for overpronation. Sometimes when you buy a new running shoe, your toes feel tight negatively impacting your entire run. This shoe provides a roomy toe box with enough room to wiggle your toes. If you’re looking for a fix for overpronation for short or long-running, these shoes will get you where you need to go. The users of this shoes cannot stress their durability enough. You get your money’s worth with New Balance. 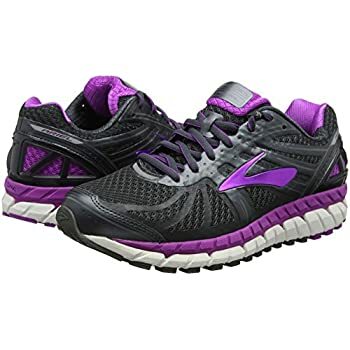 Pros-lasts through long miles, roomy toe box, comfortable even with no arches, excellent stability for long runs. 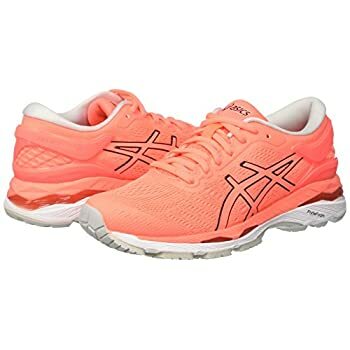 One of the top selling women running shoes in the world, the ASICS GEL-Kayano 24 is a flat foot runners dream. The design of the shoe screams comfort and stability, and it’s users have provided excellent ratings to prove it. This shoe will have you running long mileage even if you overpronate. If you run short or long, fast or slow, this shoe will provide the support you need to do so. Pros– extra comfort, great for long-distance running, breathable, excellent traction, shock-absorbing. Sister to the Brooks Beast 16, the Brooks Ariel 16 is an excellent motion control road running shoe. Not only does it provide an improved control for overpronators but its cushion is impressive. This shoe comes with a full-length segmented crash pad which provides a comfortable transition for speed training. If you have flat feet and run with a neutral shoe, besides knee pain, you tend to blister inside your inner sole. I know this from experience. After a long run, my inner feet would blister and my knees throbbed. Fortunately, some running shoes have features that help. What makes this shoe great for overpronation is the Extended Progressive Diagonal Roll Bar. It provides an added support for the inner soles so when your foot rolls heel to toe it stays in line with the rest of your body. You can imagine how this prevents foot and knee pain for runners with flat feet. Its users have reported super comfort and elimination of plantar fasciitis. Pros– super comfortable, wide toe box, inner sole support for overpronation, motion control. Cons– color options, sizes run small. 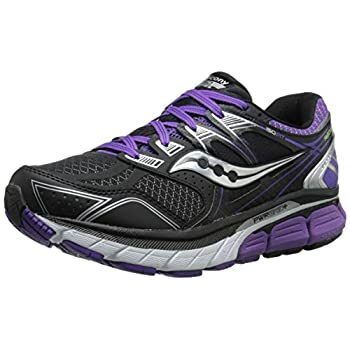 A great shoe at a great price, the Saucony Guide 10 is built for support. Not only is it comfortable but runners appreciate the built-in shock absorption. 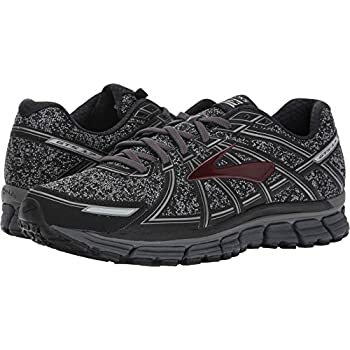 If you’re looking for a casual running shoe that is stylish and comfortable, this is the shoe for you. It’s best for clocking a few weekly runs to help maintain a fit and healthy lifestyle. Pros– price, fits well, very responsive, durable. Cons– not as comfy as other models, size change from the previous model. Mizuno provides an innovative wave technology to their shoes. It’s inspired by nature and mimics the way waves work. 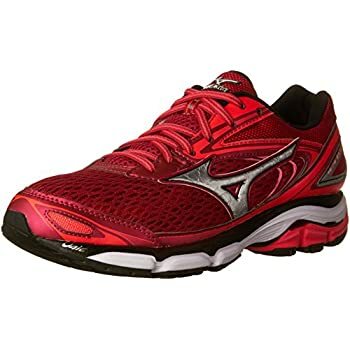 The Mizuno Wave Inspire 13 uses this wave technology. Within the shoe is a wave plate that disperses energy from impact when your feet strike the ground. The plate allows the shock a broader area which provides a superior smooth and stable ride. What a relief for flat foot runners. This shoe aims to provide stability, durability, and comfort specifically for overpronators. Sometimes supportive shoes feel heavy, especially when running long distance. Well, Mizuno does a great job to resolve this issue. It provides additional support without adding any extra weight. The design is perfect for overpronators who still want to run a fast pace on race day. Its users say it’s the best stability shoe they have ever worn. Some have also reported having cured hip and foot pain by switching to this shoe. Pros- lightweight, multiple color options, excellent stability, durable for long-distance running. Cons- some had sizing issues, price. 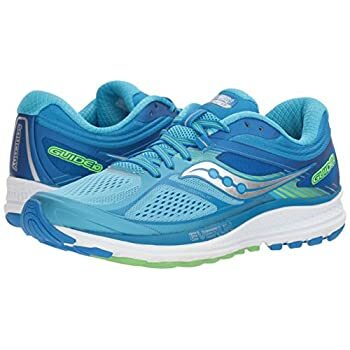 The Saucony Redeemer ISO 2 is the most stable and supportive stability running shoe Saucony makes. If you’re shopping around in search for a pain-free experience for your flat feet, then this shoe is an excellent choice. It’s designed to provide a more natural stride for overpronation. The best feature may be the ISOFIT upper section. The new ISOFIT technology offers an ideal sock-like feel. Every runner appreciates a sock-like feel once they have the opportunity to experience it for themselves. Its users say the shoe is true to size. So, if you’re buying a pair online, then you have a great chance of nailing your size down the first time. One of the reasons it fits so well is because of the roomy toe box. In my experience, a little extra room for your toes to wiggle make a big difference in comfort. If you’re planning to run long distance your entire foot needs to feel comfortable. It needs cushion from your heel all the way to your toe. And this shoe does an excellent job providing a comfortable and stable experience. If you want support, then you want Saucony. Pros– comfortable upper with sock-like feel, incredibly supportive, very comfortable, a lot of cushion without affecting flexibility. Cons- heavy, heel slippage for some. I will start out by saying I am somewhat biased towards the Brooks Ravenna 8. Brooks sent me out a pair of the men’s version for road testing. After testing the shoes with my flat feet, I can say I was certainly satisfied. Extremely long distances is the only type of running I know, and those Brooks were able to hang with my weekly mileage. The women shoe looks equally impressive. You will appreciate this shoe if you overpronate. It comes with a Diagonal Rollbar medial post which adds extra support and promotes a smoother transition. This shoe is best for running on the road with moderate pronation. When you run with a supportive shoe, you tend to run a bit slower. This is when the shoe greatness is spotlighted. The best part of the shoe is although it’s supportive, it also comes with a BioMoGo DNA midsole cushioning and rebounding rubber. So while running, it feels like your foot springs forward. This helps offset some of the extra weight that helps make it a stability shoe. It’s users praise it for an excellent fit along with a spring-like feel. They provide an extra pep to your step while offering a smooth ride for a jog in the park, a long weekend run, or even a marathon. Pros– springy toe-off, soft cushion, lightweight, smooth heel-toe transition. Cons– semi-stiff, moderate pronation support. When I first started my running journey and went to a running store to get fitted for a pair of shoes they recommend the Nike Structures. They were the shoe that brought me through training and over the finish line of my first marathon ever. So naturally, they will always have a special place in my heart. Five versions later, The Nike Air Zoom Structure 20’s are a shoe that can do the same for you. Use them for running a few quick miles to even marathon distances. Nike does a great job of designing running shoes for everyone. Not only are they functional and aimed for high performance, but they are stylish and have multiple color options. This version comes with feature after feature but what makes it different from other versions is its all-new Dynamic Support midsole. This midsole will help keep your foot supported when it attempts to overpronate. Nike also does a great job with comfort. This shoe, in particular, comes with an Ortholite® sock liner which hugs the foot helping you stay comfortable in the later stages of your run. Its users are calling it the best shoe around for overpronators. Considered a “stability” shoe, that’s what it will do, keep your feet stable for the long run. 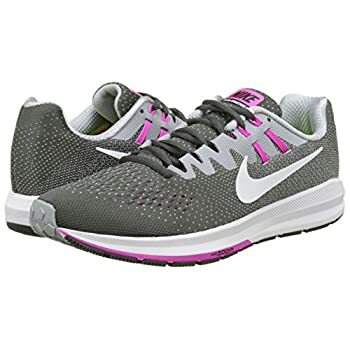 Pros– soft cushioning, lightweight, excellent stability, stylish Nike design. Cons– some experience heel slippage. Flat feet can be problematic when you are a runner, but with the right shoe, you can run with no problem at all. When you first begin as a runner, most don’t consider their foot shape and how it relates to their foot strike. However, your foot shape determines a lot about your stride. It’s essential to determine if you overpronate, supinate, or run with a neutral stride. But for us runners with flat feet, the ones with little to no arches, we overpronate. So if you pick a shoe that supports overpronation, like one of the shoes from this list, your stride can align with the body. With a stride that aligns with your body, you have a much better chance running pain-free. When your run is stable and comfortable with no injuries, anything is possible. Whether you’re looking to do some light exercising or want to cross the finish line of a marathon, these shoes will help get you there. They are made for us flat-footers and allow us to move forward and reach our full potential as runners.